Thanks to support from generous donors and the City of New York, we have raised more than $54.9 million towards our goal of $68.5 million, which includes a $10 million program and operating endowment. Theatre for a New Audience’s new home will open this fall with a production of A Midsummer Night’s Dream, directed by Julie Taymor. Now is the time to become a part of a spectacular cultural event that will draw international attention. Now is your chance to join the continued renaissance of Downtown Brooklyn. 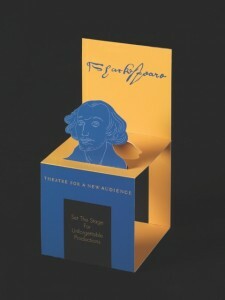 When you give a seat for Shakespeare, you help set the stage for unforgettable productions of Shakespeare alongside other classic and contemporary dramas, as well as the Theatre’s Humanities initiatives for the general public and its education programs in the New York City Public Schools that have served nearly 125,000 students from across New York City. or by e-mail at jlynes@tfana.org.